157 responses were received. Of that number, 69 of the surveys were completed by 46ers, while 87 were completed by aspiring 46ers. I asked accomplished 46ers how old they were when they summitted their 46th peak. The oldest was 66, and the youngest was 6 (?!) years old! Excluding the ages of the oldest and youngest 46er finisher, the average age of folks completing the 46 high peaks was 43.7. Accomplished 46ers took an average of 22.5 years to complete the 46. Longest: 35 years. Shortest: 6 months. I asked aspiring 46ers how old they are now. The oldest person to take part in my survey was 65, and the youngest aspiring 46er was 16 years of age. 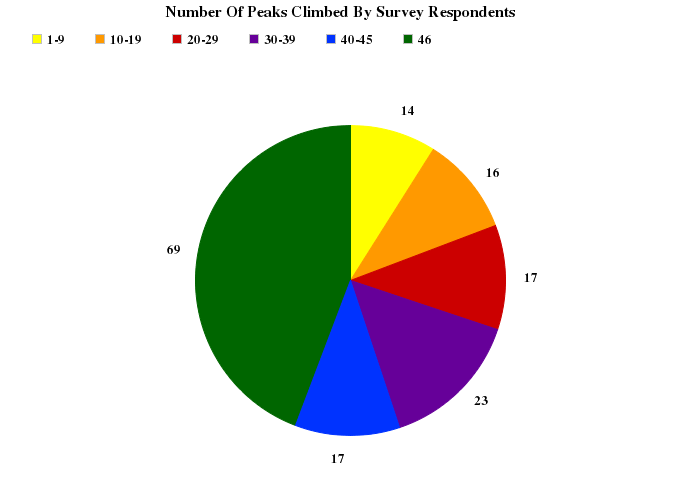 The average age of folks aspiring to complete the 46 high peaks was 38.5. * Three votes per person. Answers listing a million mountains couldn’t be tabulated. Why did you decide to embark on this goal? I started when I was in high school in the 70s. My big brother was hiking, and I wanted to be like him. I’d been to the Lake Placid area doing photography. I got curious while shooting the mountains wondering what a photo taken from the top would look like. Now I’m hooked! Fell in love with backpacking in 2006 on a trip to Peru. After climbing the Macs in a big weekend trip, I was hooked. Only thing that I do that is equally Type A and Type B personality. I was a list wh#re. Truthfully, two reasons. I started hiking late in life after a couple of surgeries when the doctor told me I had to do “something” for my body. The second reason is spiritual. To get outdoors and enjoy the wilderness; escape hectic civilization! I call it my midlife crisis. 46 over the age of 50. 10 years ago I couldn’t climb up a flight of stairs, so now I enjoy hiking because I CAN. My grandfather was past president of the Ausable Club, and the mountains were especially important to him. He inspired me to start hiking, and now that he has passed away, I am finishing them in his honor. My wife made me do it. Old scout. I like patches. I heard people talking about it on Algonquin and I realized that I wanted to have this goal to really motivate myself. And I love having this special thing with my dad! What is one piece of practical advice you would wish to impart on someone just starting out? Pick travel companions who can take care of themselves and don’t wander into the woods with more whiskey than water. It is much better to start in the dark than to end in the dark. Be prepared, err in the name of caution, and be prepared to bail out if things go wrong. Choose the option which best ensures you and your party will return to the trailhead safely and excited to return. Most of the people I’ve helped rescue put themselves in peril based on a perceived need to check off a box on a list. Don’t add fabric softener to your hiking laundry – it destroys the wicking properties. It’s always farther than it looks; it’s always taller than it looks; it’s always harder than it looks. Unless you are able to hike often, take up a complimentary sport, like running or cycling, to build endurance. Nothing makes hiking more pleasant than having stamina. For gear–buy nice or buy twice. Trekking poles – get some. And more generally…you’re capable of more than you think. If you see something that looks like you can’t get up or down, don’t panic…stop, think, look at it and figure it out. And if you really feel uncomfortable doing something, it’s ok to turn around. Learn how to use a map and compass. Seriously. Don’t be afraid to voice concerns to folks you’re sharing a lean-to with (i.e. practicing proper cooking, food etiquette.) There are a lot of idiots out there who fail to research regulations or use common sense. No one needs to wake up in lean-to to a mamma black bear hovering over them because of some moron. Seek the advice of more experienced hikers. Start out by hiking with them and develop the skills to hike solo. Always have a plan B, or the equipment/stamina to be flexible. Lean-to’s will be full, even if the register suggests otherwise. Storms will pop out of nowhere. Mountains will require more, or less, effort than first anticipated. You may have an accident, or stumble across someone else’s accident. Having a Plan B is more of a mindset and less about carrying a huge pack with everything that could possibly be needed. Get as familiar with the route as possible prior to hike day. Guidebook, map, compass, GPS, and beta from forums can separate fun from no fun. Start simple and build up gradually. Splurge on lightweight, appropriate footwear and pack with a comfortable suspension. As far as gear, these are the two items that will offer the biggest returns, and the only two which you can’t really shortcut. Believe in yourself. Know that you can do it. When it gets hard (and it does! ), know that you are up to the task. You’ll be amazed at what you can do. It’s great to get input from others, but don’t rely on that solely. Part of this adventure is figuring things out for yourself. Above all, have fun. Never underestimate the snow in the early spring. It can get ugly quick and you need to always go prepared. The best training for hiking is hiking. Gradually increasing the length and elevation gain and loss will make you a stronger hiker. Invest in proper gear, always use the buddy system, and know your limitations and strive to expand them. Decide before you start what your turn-around time will be and stick with the decision. Most accidents happen to tired hikers on the descent. For me, no hike is over until I’m back in my car. Enjoy the hike. Get to know the mountain. One thing that I find about many of the hikers, 46’ers and otherwise, is that they miss so much of the mountain because they are in a hurry to get to the next one. Some hikers hardly remember anything at all about their hikes. Nature is there to enjoy, not to fulfill a list! Never underestimate the difficulty in obtaining the goal of becoming a 46er. Why did you list Basin, Saddleback and Basin/Saddleback as 3 separate selections? Instead of having a multiple choice survey (which wasn’t an option for so many choices), I had fill in the blanks. So people wrote in their answers – not a very data friendly process. Some people wrote in that Basin was the toughest without mentioning Saddleback and some people wrote in that Basin/Saddleback was the toughest, counting it as one. (Same for the Dixes, etc.) By giving people the opportunity to write in their own answers, it made it a challenge to crunch the numbers and figure out how to lay it out accurately. This seemed to be the best way to preserve the integrity of the data. I had forgotten about this survey, it’s really cool to see the overall results and comments! It took so long to compile. And after I posted, I realized there were a few other things I meant to include. Maybe I’ll add it in later – I need a breather! Best comment: Buy nice, or buy twice. Sage advice there. There are definitely a few gems – and that’s one of them! Thanks! So very true. And that’s what I’ll be doing in the spring again, now that I’ve lost my conditioning. Tell me about it. Look at all I do to try in stay in hiking form…the only thing you can do, is to go out there and just do it (hike); there is no substitute. Can’t wait to get back into the mountains! ha! that was one of my favorites! i hope you thanked her. 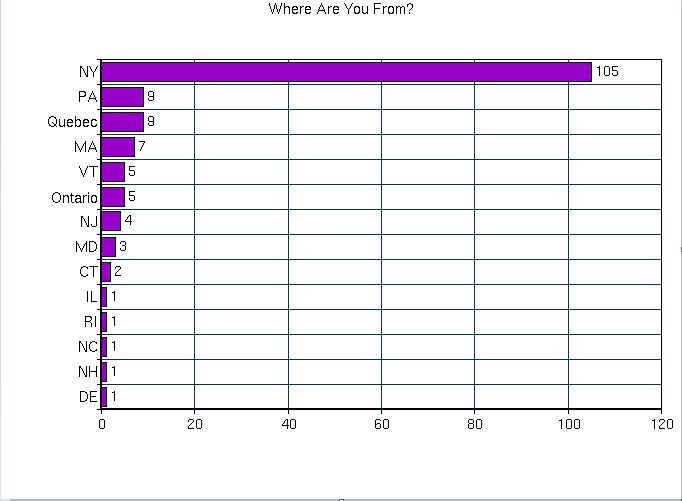 I would be curious to know on what mountain people finish their 46. I wonder if some of the choice is intentional or accidental. I’ve planned for Gray, for both my winter and regular. It would be interesting to find out how folks arrive at their choice for the finish – I’ve wondered that before when perusing the list of finishers on the 46ers site. Perhaps another survey someday…. I think that would be an awesome idea adirondack46er!!! I’m still up in the air as to which summit I want to finish on – Grace? or Dix – this way my significant other would be able to join me! Very interesting survey, and a lot of work compiling the info, I’m sure! I think I need someone to “make me do it”! What a comprehensive and interesting entry. It never occured to me that there could be so many stats involved in hiking.